Laundry stains are inevitable so it's important to have the right type of stain remover on hand when it's laundry day. Here are the top 10 stain removers for every messy situation. 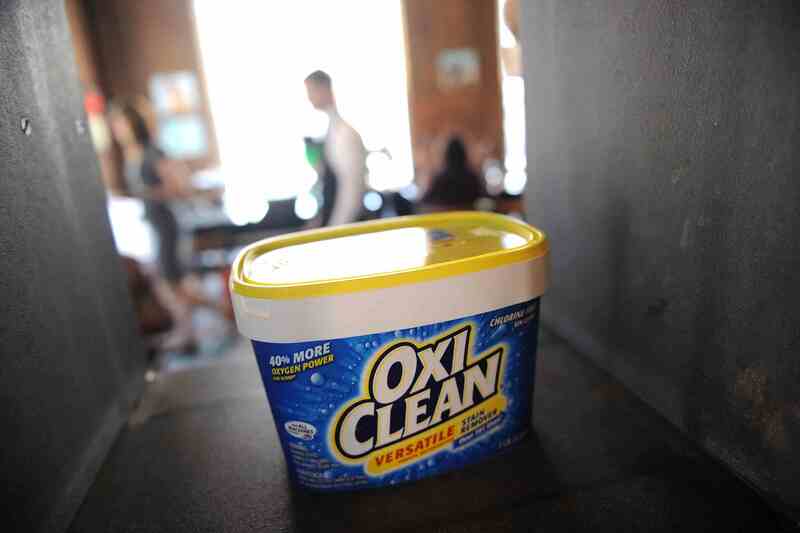 OxiClean is a chlorine free, color safe oxygen-based stain remover. It serves not only as a stain remover but a detergent booster as well as a whitener, brightener, and presoaking option for tough-to-remove stains like ground-in dirt, grass, and color transfer (dye). OxiClean can be used safely on white and colored washable fabrics, carpets, and upholstery and on hard surfaces such as tile. It should not be used on wool fibers, silk, or leather as it may damage the fabric. The key to successful use of OxiClean is patience and mixing the solution correctly. Follow the guidelines on the package as to the amount to use per gallon of water. Be sure that all of the powder is dissolved completely before adding fabric. You may want to mix the powder with a bit of hot water to dissolve completely and then add to the cooler water. The patience comes in allowing stained items to soak for at least four hours or overnight. Oxygen bleach is a gentle cleaner and works more slowly than chlorine bleach. Just dipping a stained item in the solution for a few minutes won't bring success on tough stains. You will also have much more success by using dry powdered oxygen bleach verses pre-mixed liquid versions. The longer oxygen bleach is exposed to water, the weaker the solution becomes. While close to a perfect cleaner, OxiClean is not a miracle formula for every type of stain. It won't remove oily stains, rust, dried paint, or chlorine bleach damage. OXO Brite is a dry, non-chlorine bleach manufactured by Earth Friendly Products. It is safe for colors and any washable fabric and removes most organic stains. The powder is concentrated and should be used as recommended. Since OXO Brite is a powder, it should be dissolved completely. It can be dissolved in a small amount of hot water and then added to cool water if that is more appropriate for the fabric. OXO is safe for both high-efficiency and standard washers. It is safe for septic tanks and greywater systems. No Earth Friendly Products are tested on animals or contain animal bioingredients. Stains happen at the worst times and often when you're not at home. There's nothing worse than dribbling coffee on a shirt right before a big meeting or a bit of lunch clinging to your tie. What do you do? Tide to Go and other stain removal pens and stain removal wipes such as A Little Red Bottle of Emergency Stain Rescue are safe to use on white and colored washable clothes and some labeled dry clean only. They are most effective when used on fresh stains. To use, simply squeeze the pen and use the scrubber tip like an eraser to remove stains. After treating, blot the treated area with a clean, dry white cloth or paper towel. The garment should be washed or dry cleaned as soon as possible. Leaving on the cleaning solution for an extended period without a thorough cleaning can lead to discoloration of the fabric. There is an extensive Shout Stain Remover product line from the SC Johnson Company. The most effective stain remover is Shout Advanced Gel. It is offered in a trigger spray bottle, squeeze bottle with a built-in scrubbing brush, or a foam spray. Shout Advanced contains sufficient enzymes to tackle every oily, food, mud, and cosmetic stain. For best results, the stain remover gel should be applied to the stain as soon as possible. Activate the cleaner by rubbing it thoroughly into the fabric with a soft brush or by hand. Wait at least five minutes before washing to allow the ingredients to begin breaking down stains (waiting for 10 to 15 minutes is better) and then wash in the hottest water recommended for the fabric. What began in the 1960s as a stain removal product for hospital laundries, Zout is now available to consumers. Zout is formulated with three enzymes to break down most types of everyday stains on washable clothes. Zout can be used in all water temperatures—cold, warm, and hot and is safe to use in high-efficiency and standard washers. The product can be used on most washable fabrics except silk, wool, cashmere, and leather. The product is water-based, non-corrosive, non-flammable, and biodegradable. Zout does not contain chlorine or bleach and is safe for all white and colorfast washable fabrics including children's sleepwear. Before using, the colorfastness of the stained item should be tested especially if it has never been washed. Apply a small amount of Zout to an inside seam or hem. Wait 10 minutes and then wipe away the stain remover with a white paper towel. If the color is transferred to the towel, do not use Zout to remove the stain from the fabric. Zout is readily available online and on most mass market stores' laundry product shelves. Clorox bleach is an effective disinfectant to remove bacteria that can cause illness or excessive odors in clothes as well as to remove stains and whiten cotton and other natural fabrics. It is also an excellent cleaning agent for washers by killing germs and mold spores. The key to success in using Clorox bleach is to use it correctly. It can damage fabrics if used in a high concentration and will remove the color from fabrics. Clorox bleach should always be reclosed tightly after each use and stored in a cool, dry place to avoid deterioration. Chlorine bleach deteriorates rather quickly after opening, especially at higher temperatures. If you have a bottle of bleach that has been open for more than three to five months, it should be discarded and you should purchase a fresh bottle. The older bottle will not cause harm, but you just won't have much effectiveness in cleaning and none in disinfecting clothes. Earth Friendly Products' ECOS Stain + Odor Remover is a biodegradable stain remover formulated to remove food, coffee, blood, oil, and dirt from washable fabrics. The product doesn't contain animal products or Sodium Lauryl Sulfate, which can be a skin irritant. It is recommended for use on fresh stains. Spray the stained area, let it sit for one minute, and then rub lightly. Do not allow product to dry on fabric. Wash the stained clothing as usual in the appropriate water temperature. ECOS has embraced every aspect of living a green life by building plants that reduce the company's carbon footprint. It has a very focused mission and is part of the EPA's Safer Choice certified for all laundry products. Because each Stain Devils is individually formulated to remove specific stains, stain removal instructions are different from formula to formula. Take time to read and follow the directions printed on the label of the bottle you are using. Each of these products can only be used as a spot-treatment for stains. Do not use the product as a prewash and add to the washer or soak clothes to remove stains. While Carbona Stain Devils perform adequately in removing stains, they are more expensive than other brands. Most commercial stain removers will cover a wide range of stains and you do not need to purchase separate bottles for each one. Standard spot cleaning practices are not always best for dry clean only fabrics such as wool or silk because they can cause discoloring and leave water marks. So, it is important to keep a dry cleaning solvent on hand for quick stain removal when you can't get to a dry cleaner. Dry cleaning solvents also work well to remove stains, especially oily stains, from upholstery and carpets. Because they can contain chemicals that are irritating, follow directions carefully and use in a well-ventilated space. Fels-Naptha and other laundry soap bars are most effective as an oil-based stain remover for stains like makeup, cooking oil, chocolate, and body soil on washable fabrics. To use, wet the stained area, rub it with the bar of soap working the product into the fabric, and allow the soap to work for at least five minutes or more before washing the garment as usual. Laundry soap is also effective for removing poison ivy resins from clothing that has been exposed. Always handle exposed fabrics with protective gloves until completely clean. Fels-Naptha is often included as an ingredient in homemade laundry detergent by shaving or grating the bar. What is Oxygen Bleach and How Do I Use It for Laundry?